A slew of speakers were on hand to introduce freshmen to a slice of life from MIT at the President's Convocation held yesterday morning in Kresge Auditorium. President Charles M. Vest opened the convocation with his traditional welcome, tweaked to apply to the class of 2002 . Following Vest's remarks, which included the equally traditional reassurance that freshmen were "not admitted by mistake," the students heard addresses from Nancy H. Hopkins, a professor of Biology, Dean of Students Rosalind H. Williams, and Undergraduate Association President Paul T. Oppold '99. Professor of Geology Kip V. Hodges PhD '82 closed the morning proceedings with an audio-visual presentation entitled "Contact MIT." Vest introduced Hopkins as a researcher into embryonic development and cancer research. Hopkins told students that her wish for them was to "fall in love� with an intellectual vision of the future." She told the story of the beginnings of her own interest in biology which were sparked by attending a lecture given by James Watson, co-discoverer of the structure of DNA. Hopkins, who had intended to study mathematics, had "fallen in love with DNA." She changed her major and is now conducting a large scale experiment to pinpoint the genes responsible for the development of the zebra fish. The fish were chosen, Hopkins said, since "humans are not volunteering for the types of experiments we are conducting." During her lecture she outlined the five day development of the zebra fish embryo and demonstrated genetic modifications to animals including a zebra fish with fluorescent blood and a sheep whose coat falls off without shearing: genetic tricks that Hopkins called "child's play really." Hopkins ended her address by attempting to explain what drives her to undertake an experiment that has taken years of her time and entails the cleaning of over 4,000 fishtanks. Hopkins pointed not only to the possible economic success of drugs produced from similar research but to the less quantitative "desire to answer the questions� desire to know the answer." Kip Hodges began his engaging "Contact MIT" program by appearing in a scarf. 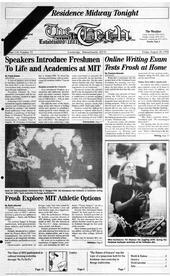 Alluding to the recent film Good Will Hunting, Hodges said that freshmen should see "at least one MIT professor wearing a scarf." Hodges played off Good Will Hunting throughout the presentation, using scenes "shamelessly pirated from the movie" compared to videos created by Hodges to debunk myths about MIT. One scene compared the posh office of fictitional math professor Jerry Lambeau to an actual math professor's office, which more resembled an antique show than the Victorian sitting room of the film. Recent films continued to play a role in Hodges' presentation as he presented the popular image an MIT graduate as "the smartest guy on the planet." JeffGoldblum, he said, "holds the record for degrees from MIT." Other fictional degrees have been awarded to Steve Buschemi and Billy Bob Thorton, Hodges pointed out. Following this exploration of popular media, Hodges presented a history of MIT focusing on the influence and vision of Vannevar Bush '16 who was key in the founding of MIT's radiation laboratory and the National Science Foundation. Hodges presented Bush's vision of an education grounded in the basic sciences but with technical "know how." In closing remarks, Hodges told freshmen: "This is not the place for vocational training." For students that were looking for such training, Hodges said, "The exits are clearly marked." Freshmen in attendance had positive reactions to the program. Katonio Butler '02 called the program "great" and said that it was "very interesting in a way that could relate to us." Pavel Gorelik '02 said that it was "entertaining at the very least." Richard Frank '02 said that it was better than the welcome dinner which took place on Wednesday night. The only criticism the three students offered was an initial uneasiness surrounding the pounding beat and flashing lights which ushered president Vest to the stage. Following Hopkins' lecture, Vest introduced Williams as "the dean." Williams opened her short remarks by telling students "you are here for the professors, not the administrators." She gave the assembled freshmen several points of advice, with the disclaimer that "I'm not your mom; MIT is not your parent." She told freshmen to watch their diet, to get an adequate amount of sleep, and to be careful when crossing the street. Williams also encouraged the class to explore Boston and New England. The "city around you is another university," she said. Williams also made freshmen aware of the support structures available to them. "University is an inherently uncomfortable place," she said. Oppold was greeted by raucous cheers from the participants in the freshmen leadership program in the audience. He attempted to describe life at MIT through the metaphor of a box which must be made to hold rocks, which represented studies and other responsibilities, and pebbles and sand which represented less important activities. You have to "make sure your big rocks fit," Oppold said.